If there is one bit of information that we want to convey, it is this. The Power of Significance is easy reading. There's no fluff. This is so refreshing. It is so good to read someone who has something to say and doesn't create a Matisse with only an up-front view and asking the reader to figure it all out. 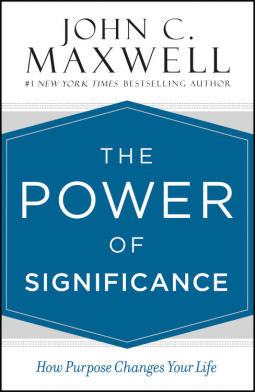 Another favored aspect of reading Power of Significance is that the author is a Christian man. However, he's not, "All up in yer grill," about it. We would be fine with this, if he were. But, he's not. He uses his background to tell the story. That's it. Power of Significance is for those who are not content to simply exist, to live with insignificance or to let the waters of life just roll up on them with no plans for tomorrow. If you just give the book a chance, you will find that motivation is an inherent thing. It is something that is inside you, perhaps, waiting to be roused? John C. Maxwell. John C. Maxwell is an internationally recognized leadership expert, speaker, coach, and author who has sold over 19 million books. Dr. Maxwell is the founder of EQUIP and the John Maxwell Company, organizations that have trained more than 5 million leaders worldwide.